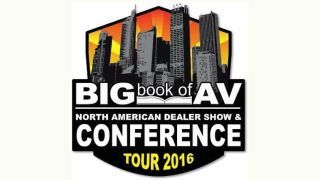 Returning from its first transatlantic tour in the U.K. and Ireland, Stampede is set to kick off the second half of its 2017 North American Big Book of AV Tour & Conference Series in Columbus, OH on September 14. The daylong conference will be held at The Westin Columbus from 10:00 a.m.–2:00 p.m., and registration is now open here. Beginning at 9:00 a.m. there will be a dealer panel discussion, followed by the opening of the Tech Showcase Exhibits at 10:00 a.m. where attendees will get the chance to meet one-on-one with the top pro AV manufacturers showcasing their newest products and technologies. The first presentation, “Overview of the Drone/ UAS Industry and Business Potential” by Rob Luther, Drone Video Systems, will begin at 10:15 a.m. Other presentations include “NEC 10 Steps to a Successful Video Wall” by Mark Weniger, account manager, Channel Sales, NEC; “Drone Video Systems: A New AV Category for a New Age of Opportunities” by Rob Luther, Drone Video Systems; and “Cut the Cords: BYOD and Wireless Presentation from Any Device” by Cary Benjamin, regional sales manager, wePresent. Each event includes exhibits, training sessions, product introductions, and networking opportunities. Participating exhibitors include Christie, Hitachi, DisplayTen, Dynascan, Calibre, SY, Draper, Vogel’s Products, eBeam, Vivitek, Vidyo, Panacast, PTZ, TeamMate, DJI, and Yuneec.